With more than 10 different pronouns exercises that allow students to choose the correct answer, they will understand exactly what a pronoun is and what sets it apart from other parts of speech. When students are ready to learn how pronouns interact with verbs and other words in a sentence, provide them with Pronoun antecedent agreement exercisesThat give concrete examples to drive the point home. Teach your third grader the importance of subject pronouns and noun-pronoun agreement with these exercises that are specifically developed for their age group. Relative pronouns make it simple for your fourth grader to describe the subject of a sentence in a fluid and orderly way. Give them the practise they need with these exercises and helpful hints. Matching pronouns with their antecedent in writing can be confusing for some fourth graders, but these exercises were developed to aid in student understanding and retention. Build your fourth graders' writing skills with these exercises that have them practise matching possessive pronouns to their antecedent. Replacing possessive nouns with possessive pronouns helps your students' writing sound more natural and makes for an effortless read. Give your fifth graders the practise they need with these exercises created specifically for their age group. The use of pronouns can make simple sentences more fluid and natural, but incorrect usage can change the meaning all together. Avoid this complication by having your student complete these exercises to solidify concepts. Stuck using long strings of nouns to describe a scene? You don't have to run out of breath every time you want to talk about a person, place, or thing. Try a pronoun in a noun's place to shorten your sentences and give your writing a more streamlined look. Pronouns are nouns that can replace more formal ones, like the tree, my sister, or Chattanooga, and they can come in super-handy. 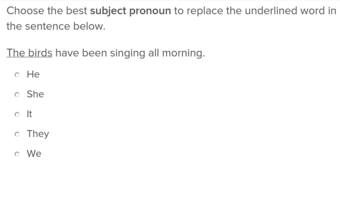 Work with all different kinds of pronouns, from possessive to relative to reflexive, using these pronoun exercises developed by the experts at Education.com. In our exercises, kids can challenge themselves with a variety of multiple choice quizzes that tackle several types of pronouns. 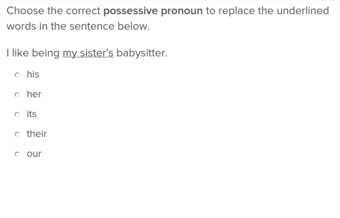 With our online exercises, pronoun mastery is just a few clicks away. For more practise or a fun challenge, try your hand with other Parts of speechAnd see if you can string together a complex sentence.